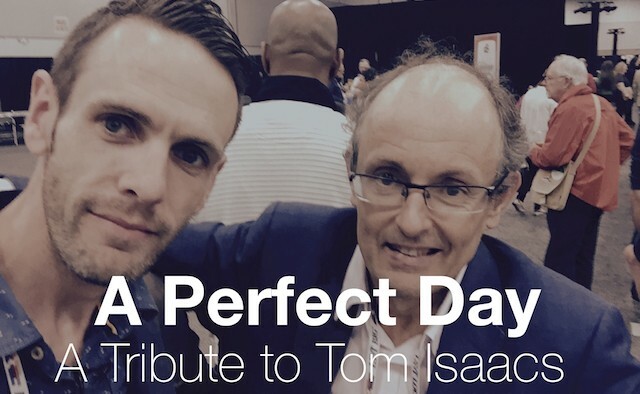 When the news spread about the sudden and untimely death of Tom Isaacs, co-founder of The Cure Parkinson’s Trust, campaigner David Sangster was reminded of Tom’s love for music –and decided to put together a video tribute featuring dozens of people with Parkinson’s. David had met Tom a few times over the course of the last few years and was one of the many people with Parkinson’s in attendance at one of Tom’s last public speaking appearances in April. “Tom was an inspiration for so many of us living with Parkinson’s. His sense of optimism, his determination, vision and fun were not just attributes one would use to describe Tom, but equally they were tools he would always use to good effect when he spoke publicly, like he did just weeks before his untimely death when I spent some time with him and The Cure Parkinson’s Trust. “Before he talked about his pursuit for a cure, he would always refer to his ‘license to spill’ as he tried to explain his dyskinesia resulting in what he promised would be a ‘moving’ speech,” David continued. Tom loved music and would often replace the words from a popular song to fit around Parkinson’s, research and the hope for a cure for the condition. In September, The Cure Parkinson’s Trust hosted a celebration of life for Tom, where David screened the video for the first time. Thank you Almaz and the gang ! Great Story about David and the World Advocates !